England Women won by 1 wicket. Right, it's time for us to sign off. It looked certain to be a routine victory but in the end it was anything but. However, England were able to sneak home off the final ball to reach 109-9 and claim a one-wicket victory over West Indies. You can read our developing report here. Join us again on Friday when we'll have live text coverage and in-play highlights of the men's tournament as Australia face Pakistan from 09:30 GMT before South Africa against Group 1 leaders West Indies at 14:00 GMT, in a match that could have a large bearing on England's chances of reaching the last four. See you then. Cheerio for now. 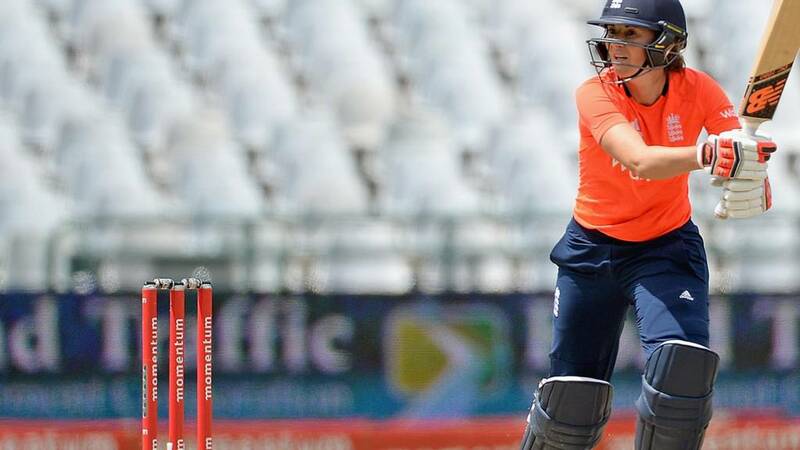 For England, the opening stand between Charlotte Edwards (30) and Tammy Beaumont (31) laid an ideal platform, while Nat Sciver kept cool in the chaos of the closing overs, her 19 not out crucial as wickets tumbled all around her. No other batters reached double figures though so plenty to work on. Anya Shrubsole was the pick of the England bowlers, taking 1-11 from her four overs, while the 24-year-old's pair of twos off the first two balls of the final over was also vital in earning the victory, even if she wasn't there at the end. Sally Smith: A win is a win - sometimes you have to win ugly though. Martin Jubb: Hell's bells. These last two WT20 games have been mad. What happened to easy wins?? And @ejrainfordbrent is right- we can't bat. England captain Charlotte Edwards is a very relieved woman after her side scraped home, telling Sky Sports: "We want to play better. We got ourselves in a great position to win the game very comfortably. "We got the win and that's the most important thing." For all that England lost their way badly in the second half of their innings, we have to give credit to West Indies for the way they somehow dragged themselves back into the game and came oh so close to snatching victory. Afy Fletcher finished with figures of 4-12 from her four overs while Shaquana Quintyne wasn't too shoddy either with 4-19 from her quota. And it's all over in Delhi as Pakistan finish 114-1, winning by nine wickets. Steph Robinson: England women giving me a heart attack in them last few overs. Adrian Love: Will England ever win comfortably? Don't think my heart can take much more of this. "Well done to England for getting over the line, but there is a big, big issue with the batting. They are not going to win a World Cup with the way they are playing." Right, let's catch our breath. That's three wins from three and takes England closer to qualification for the semi-finals with a game against Pakistan to come on Sunday. They are doing it the hard way, though, scraping past India by two wickets when chasing 90 on Tuesday and cutting it even finer here. Wow! Sciver fails to connect but the England batters set off for a bye and the throw from the wicketkeeper, Merissa Aguilleira, misses! England win off the final ball! Despite themselves. They got away with one there. Thrilling finish. A scampered single for Rebecca Grundy. England guaranteed a super over at least but can Nat Sciver win it off the final ball? Left-hander Grundy facing...here's Dottin. A wide! Down the leg side. What a bonus for England. Two from two now. Here it is, a superb set of boundaries from Bismah Maroof. Three on the bounce. Pakistan within touching distance of victory now. "It was just back of a length and cramped Anya for room. The danger is that Rebecca Grundy is coming in - she's not renowned for her batting." "Shrubsole covers her eyes, she can't believe that has happened." Oh, my. Anya Shrubsole is cleaned up by Deandra Dottin. It's all down to Rebecca Grundy now. How has this happened? Three from two required, one wicket left. A dot ball from Dottin. Three from three. Could a super over be in store?